Cool composure characterises the design of silent rush. Exemplary ergonomics and comfort make it a sitting experience. The organic shell shape in combination with the luxurious upholstery brings a new feel to the modern office environment: the comfort of home. 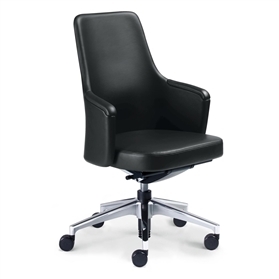 The visual elegance of silent rush is unmistakable, right down to the functional details, such as the aesthetic lumbar support adjustment on the rear of the swivel chair. With its feel-good character, silent rush is perfectly at home in any situation – conference room, business lounge or foyer.